A packing list will help when you're getting ready to pack for your trip. What you need to take with you will depend on your destination and travel style. You'll need different things for a safari than you will for a cruise. What you pack for Antarctica will be different than what you will take to Hawaii. Are you going to a health spa? A dude ranch? On a diving trip? A driving trip abroad? All of those things will affect how you pack. We have lists for those below... and all kinds of tips about packing and luggage. 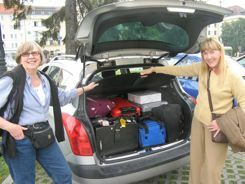 A packing list helps you packing light... and helps pack the car! A challenge for 4 of us in Poland. We always start with our basic list, then fine tune it for our current destination. What you can fit in that plastic bag? How do you pack your cosmetics? Basic Packing List - This is where we start for every trip. You can travel almost anywhere for two weeks to two months if you just tweak this list sensibly. Packing For A Tropical Vacation - What we pack for warm and humid weather... whether we're scuba diving, hiking rain forests or relaxing on a beach. What To Pack For Cold Weather - A cruise to Antarctica tested our packing skills the most. Cold weather does require more and heavier clothes, but you can still keep it to a minimum. Mixed Weather - We Have A List For That - Shoulder season is when we love to travel, and that can mean warm AND cold weather. You can still manage with only carry-on luggage if you plan for layers. Why Put Identity Tags on Carry-on Luggage? Packing Methods... Roll It? Fold It? Stuff It In? How to Pack That One Quart Plastic Bag? Requirements For That One Liter Plastic Bag? Keeping In Touch... Not Just Postcards! These are all just guides. Use them to make your own list. Lists help you stay organized. You'll worry less that you might forget something important. Even if you do forget something, just remember that you can probably get it almost anywhere in the world.